…May was the hottest May since records began in Jerez de la Frontera, June was the hottest June and now July is sizzling too. Temperatures in the high thirties are tolerable, but if it hits the forties the city becomes semi-nocturnal. By lunch-time the streets are empty of all but tourists and the city dozes. The siesta normally ends at about five thirty or six, but, when temperatures are high, the town doesn’t re-energise until much later, when things are cooler. At the weekend this meant that the squares and bars didn’t fill until ten (though the tourists were there earlier) and the buzz continued until two or three in the morning. 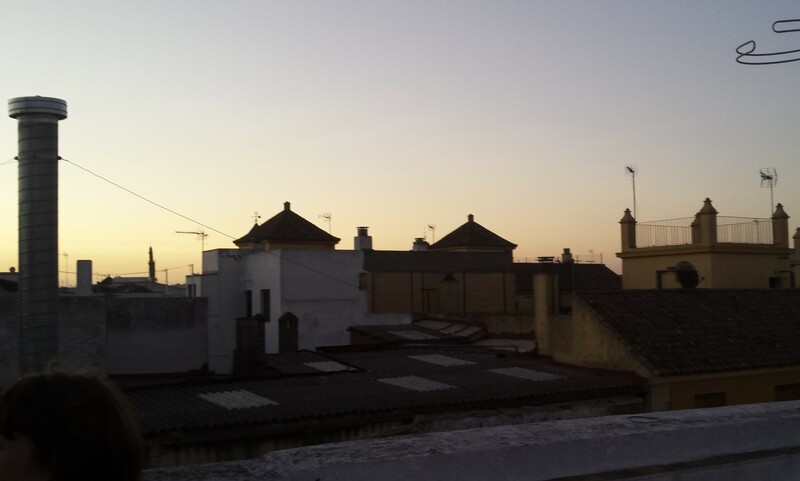 I was at a barbecue on Friday night, on a friends’ roof terrace over-looking Plateros Square. The cooking didn’t begin until ten, it would have been too hot otherwise, but while that was underway we watched the sun setting behind the cathedral, from the azotea, accompanied by the clack-clack of the storks nesting on the top of the nearby church tower (two offspring this year). 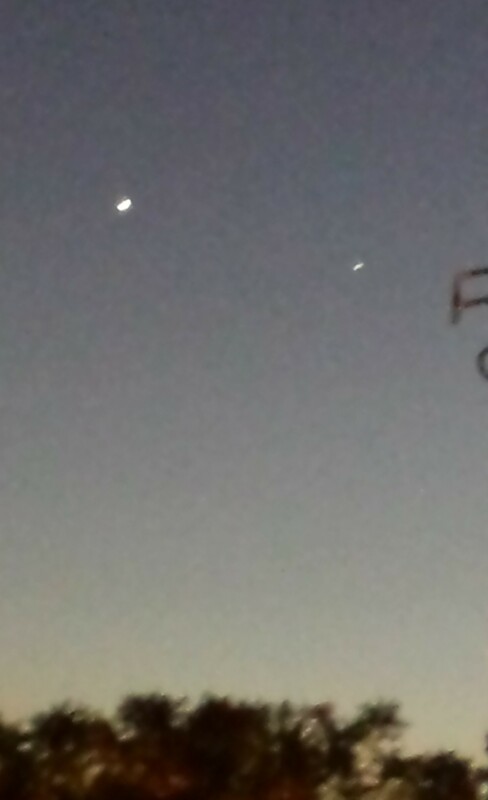 Above us Venus and Mars were in conjunction. Plateros features strongly in my next novel, ‘On the Frontier’, which I was working on while in Jerez. 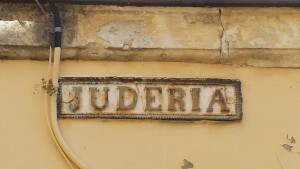 It’s where one of the main characters lives, in the Juderia, or jewish quarter. He and his friend escape confinement by climbing over the rooves from their attic, onto a roofscape not unlike the one that is there today (though without the tall metal chimney, see below, which belongs to a restaurant). 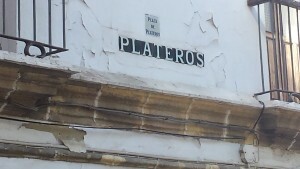 Plateros and many of the old cobbled streets of the Juderia are still there, in the south-east corner of the walled centre, the narrow, winding alleyways linking the more modern squares, like Plaza del Banco with its wrought iron band stand and the more ancient, Plateros or Plaza Ascuncion, with its mudejar church of San Dionysio, the patron saint of Jerez. The Plaza Mercado is still there too, with its rectangle of palm trees at its centre (this square is significant in the novel too). 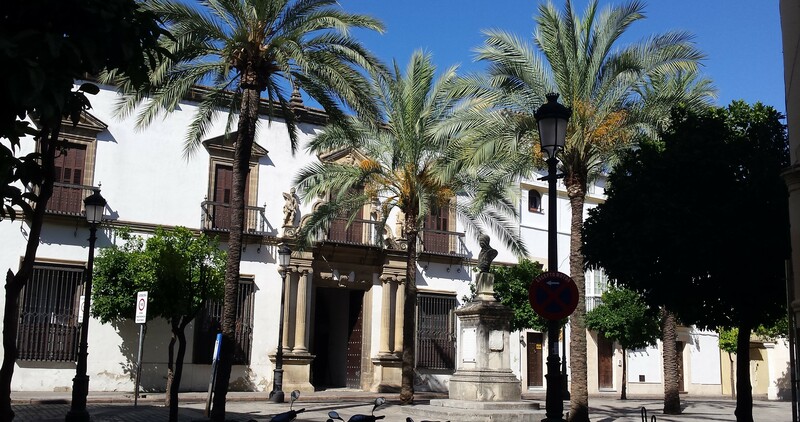 Jerez’ excellent archeological museum, itself housed within a palace, stands on this square. Jerez has many fine houses and palaces, although most are of more recent vintage than the 1200s, when my novel is set. But there are still buildings from the 13th century and before, the Alcazar, the cloisters of San Domingo and many a church (or ex-mosque). The old city walls can still be seen, either free-standing or incorporated into later constructions. An ice-cream parlour, an hotel and three restaurants, to my knowledge, exhibit sections of wall with pride. If you buy a house on Porvera, the street of the jacaranda trees, you get a portion of the old city wall too, including the battlements, which some folk have turned into gardens or seating areas (it’s a selling point). 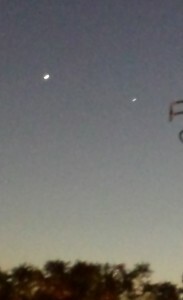 Unfortunately you are also, I am told, responsible for its, often expensive, up-keep. 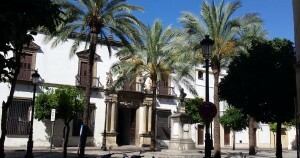 Many of the old buildings have new functions, so the Palacio above is now a school. On the Larga, the main shopping street, many shops can be found within ancient Palace buildings, now air-conditioned. Conversely, there are bars and eating places in the old centre, which look as if they belong in a by-gone age. Such as La Pantilla, an establishment which seems to be straight from the mid-20th century, with its peeling bull-fighting posters and ancient machinery. It is very popular, not least for its prices, which, while they aren’t quite 1960s, are certainly very reasonable for 2015. It serves sizzling chorizo, local spicy sausage, but flamed at your table. It tastes good. 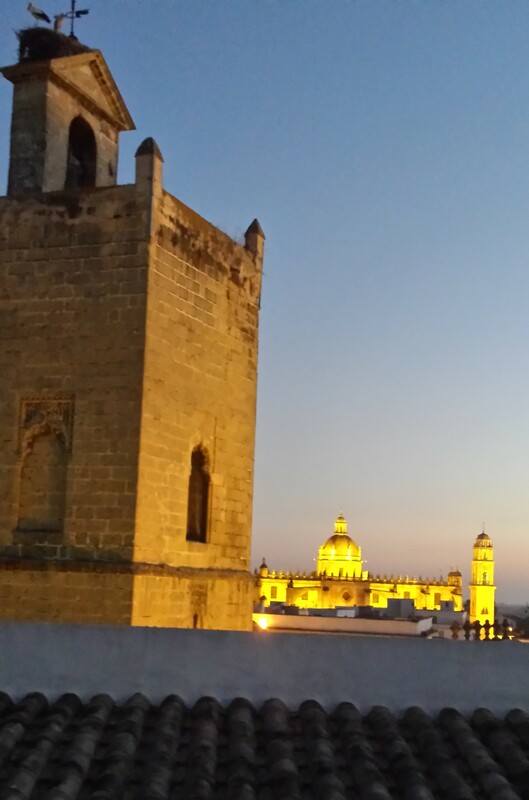 Jerez may be sizzling, but it is not aflame and there are huge forest fires elsewhere in Andalucia. The countryside around Jaen has been destroyed by fires which have raged for days, there have been evacuations from the hills behind Malaga and towns near Alicante and Guadalajara have been threatened. And we still have August yet to come.